Remember the days spent with the family enjoying your swimming pool and spa, escaping the scorching Florida heat and retreating to the cool, crystal clear waters of your pool? 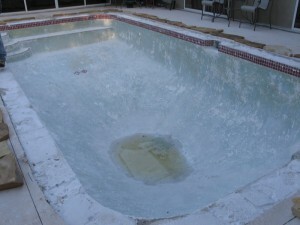 As with everything in life, time tends to take a toll on keeping up with the maintenance and care of your pool. However, just because you’re swimming pool might be older, it doesn’t mean your days of enjoyment are over! With over 25 years of experience, Elite Weiler’s Pool Remodeling Division specializes in swimming pool remodeling jobs from simple touch-ups to complete swimming pool modernization, including total style makeovers. We bring our skilled pool builders and experts to your backyard anywhere in Sarasota, Manatee, Charlotte, Desoto and surrounding Florida counties. We are more than prepared to meet the challenges that exist in remolding and updating the swimming pools of yesterday. Proper swimming pool remodeling is an involved affair. Beware of the salesman that tells you otherwise. A swimming pool is a system, where one piece affects all other. Therefore, if you plan to renovate your swimming pool and spa, do it right the first time with Elite Weiler Pools. Want to enjoy your pool again? We can help! Call 941-343-9001 now. Many simple swimming pool remodeling projects won’t require plans, but if yours is an extensive remodel, make sure your consultant explains and shows what the selective demolition and rebuilt project will entail. Plan for the unknown by letting Elite Weiler review the challenges that could arise. The process of swimming pool remodeling is similar in many ways to pool construction with the exception generally being demolition. The permit and inspection process is a little easier, and most often the excavation, steel placement and gunite phases don’t even exist (typically following demolition, the masonry aspects of the project begin.) In more extensive projects, such as spa or negative edge additions, the remodel may require excavation, steel and gunite work.